A couple of tablespoons of rosehip powder daily make the skin more elastic and less dry, and wrinkles less visible. Anti-aging researchers at Mae Fah University in Thailand discovered this when they did trials with a Danish rosehip product. The researchers performed an experiment with 34 subjects aged 35-65. Half of the subjects were given 45 g of a standardised rosehip powder daily for eight weeks. The powder was made from 50 percent rosehip seed and 50 percent fruit. The researchers used Hyben Vital/Hi-flex rosehip powder, manufactured by the Danish Hyben Vital. [hyben-vital.com] Officially Hyben Vital did not finance the study. The company did perform the data analysis based on the researchers' results. 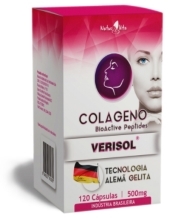 In addition, the person who led the research also worked as a consultant for Hyben Vital. The control group took 4 mg astaxanthin daily. The researchers assessed the subjects' skin condition just before starting administration of the supplement, halfway through the supplementation period and at the end of it. 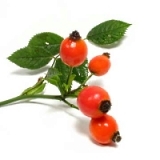 The rosehip powder improved the subjects' skin hydration and elasticity. The subjects' crows' feet at the corner of their eyes became a little less deep, as the figure above shows. The photos below show the effect of rosehip supplementation on the facial skin of one of the subjects. "A certain galactolipid, GOPO, [structural formula on the right] was recently isolated from the present rose hip species", the researchers wrote. [J Nat Prod. 2003;66(7):994-5.] "The present powdered rose hip as well as the galactolipid GOPO, when isolated, was shown to reduce MMP-1 gene expression. This is interesting as MMP-1 is an enzyme responsible for the breakdown of cell structures such as collagen." "Intake of the standardized rose hip powder (Hyben Vital) improves aging-induced skin conditions", the researchers wrote. "A well-powered, large-scale, placebo-controlled follow-up trial on the actual skin conditions is strongly warranted for supporting the present pilot study. The present study on cell longevity should also be repeated and in large-scale placebo-controlled settings." Clin Interv Aging. 2015 Nov 19;10:1849-56. The most important factor in skin aging, ultraviolet light, may be reduced by supplementation with Trametes versicolor. A daily dose of 2.5 g of the gelatin-protein Verisol, which you can buy in any chemists or health food shop, restores brittle nails to health. A daily dose of 50 mg Q10 is enough.